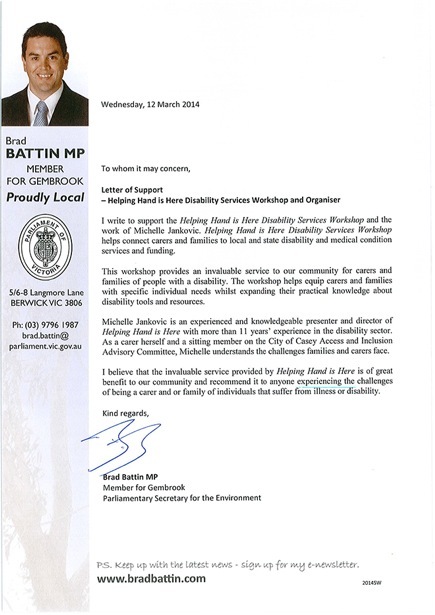 I write to support the Helping Hand Is Here Disability Services Workshop and the work of Michelle Jankovic. Helping Hand Is Here Disability Services Workshop helps connect carers and families to local and state disability and medical condition services and funding. This workshop provides an invaluable service to our community for carers and families of people with a disability. The workshop helps equip carers and families with specific individual needs whilst expanding their practical knowledge about disability tools and resources. Michelle Jankovic is an experienced and knowledgeable presenter and director of Helping Hand Is Here with more than 11 years’ experience in the disability sector. As a carer herself and a sitting member on the City of Casey Access and Inclusion Advisory Committee, Michelle understands the challenges families and carers face. I believe that the invaluable service provided by Helping Hand Is Here is of great benefit to our community and recommend it to anyone experiencing the challenges of being a carer and or family of individuals that suffer from illness or disability.